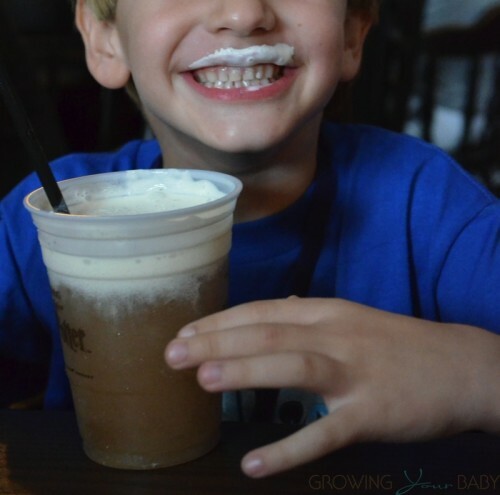 Home » A Whirlwind Day At Universal Studios Orlando! 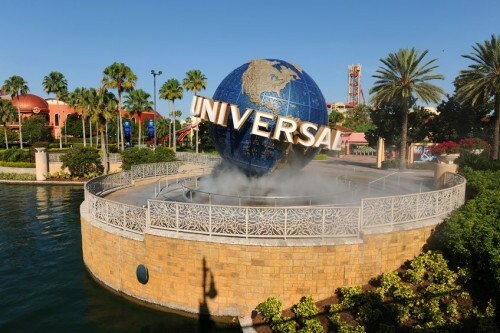 It had been 25 years since I had visited Universal Studios Theme Park in Orlando. In fact, I didn’t even remember going as a child until I saw the ride Disaster. At that time, the park was a quarter the size and the rides were cool, but they have definitely come a long way..
Now more than two decades later, I was beyond excited to take my kids. Each 46”, they are now at the age where they can go on some of the exciting rides. No Mummy yet, but they are definitely eligible to go on about 90% of the rides at Universal. For this trip we had BIG plans – we wanted to see both parks in one day. A tall order, this also meant we would have to narrow down the rides we visited at each section of the park. Thankfully we were fortunate enough to be able to navigate the parks with a tour guide. If you are able to – I HIGHLY recommend looking into this service. There is a lineskip feature and the staff that takes you around is full of so many incredible facts about the park and how it operates. Because we were visiting on a rainy day(sunny pictures are stock photos), we were given ponchos and headed out to experience everything Universal had to offer. 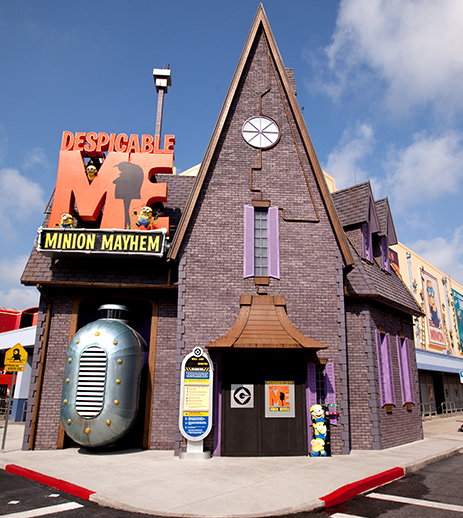 First stop for us was the Despicable Me ‘Minion Mayhem’ ride. My kids have just recently fell in love with this movie so they were thrilled to jump right into the action. My husband, however, hadn’t seen it but was brought up to speed pretty quickly as we made our way through the different chambers that ‘prep’ you for the ride. The premise here is that you are in training to become a Minion. Gru, the movie’s main character is working on something big and he needs ‘more’ helpers to get the project done. From start to finish this ride is FULL of fun moments. It really goes to show that you don’t need to be on a massive roller coaster to experience the big thrills. 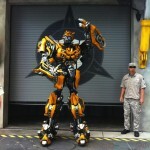 Our next stop was Universal’s new Transformer’s 3D ride. I will admit I have not seen any of the latest movies, but was a huge fan as a kid. The ride is top to bottom excitement. Created in the same technology that has made their rides famous, guests board a car that immediately takes them into battle. 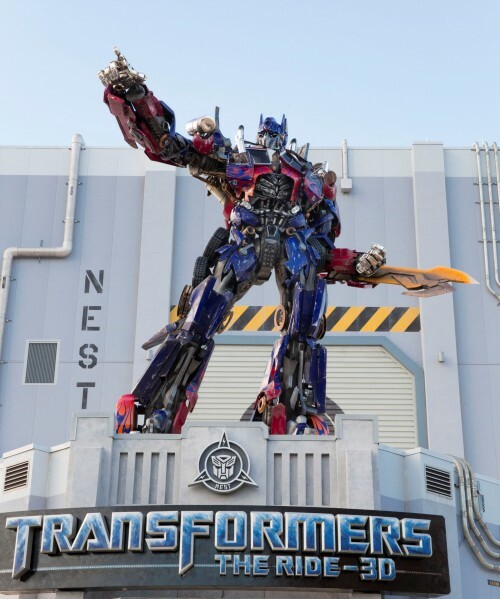 ‘Fight alongside Optimus and try to survive as you protect the AllSpark from Decepticons over four stories tall.’ Going on Despicable Me first prepared the kids for the movement and adventure, but Transformers took it to the next level with it’s incredible graphics and special effects! If you visit Universal in the future, this ride is a MUST do! It is longer than a roller coaster and much more immersive. To add to the fun, Bumble Bee came out and posed for pictures afterwards! Next up was the Simpsons. Our kids had never seen the show, but they didn’t really need to because the ride tells the story quite well. After making our way through the house we were divided into groups of 8 and ushered into individual chambers where you watch a video and then get into your roller coaster car. Similar in concept to the previous rides with the motion simulator, this four and a half minute long ride takes you with the family as they head to Krustyland, where everything goes awry very quickly. The Simpsons is the longest-running scripted show in television history for a reason – they are quirky, unpredictable and comical. This ride mirrors their on-screen adventures perfectly! While we were having lunch some of the bigger members of our group made the decision to quickly ride the Mummy. The rider height is 48” so our boys were too small to ride, but my husband who is almost 6’ was good to go! 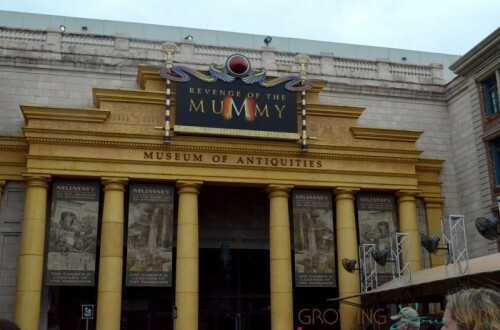 It was still raining, BUT as luck would have it, the Mummy is an indoor roller coaster so our day was still on pace. Full of ‘terrifying thrills and spine-tingling excitement’, this ride catapults guests at speeds up to 45 mph in virtual darkness. My husband loved the unpredictability of this ride and the fact that it threw you backwards without any notice. This paired with fire, huge drops and never ending suspense made it his favorite of the day! My favorite was still to come as we made our way into the Islands of Adventure park! I would not say that I am a Harry Potter fanatic, but I am a fan. I love how well each section of this series’ was written and think the whole world is incredibly complicated, yet genius, and for this reason I was excited to see how Universal interpreted it. Going into it, I wasn’t prepared to be blown away, but I was. 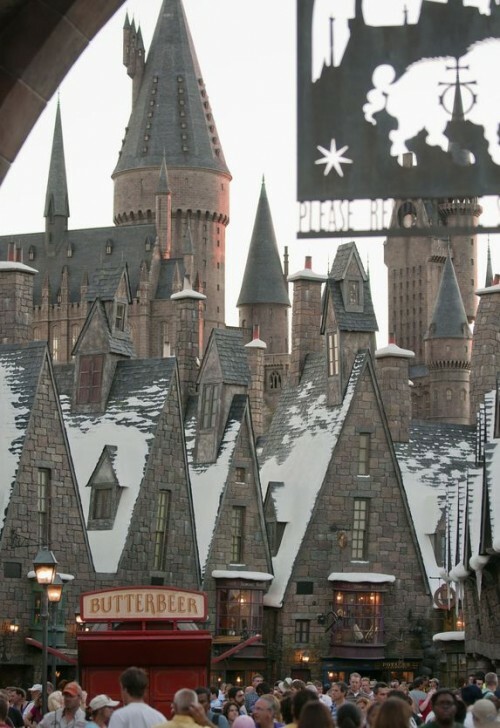 The Wizarding World of Harry Potter is incredible. So incredible, that I just stood there as we passed through the gates taking in every detail. 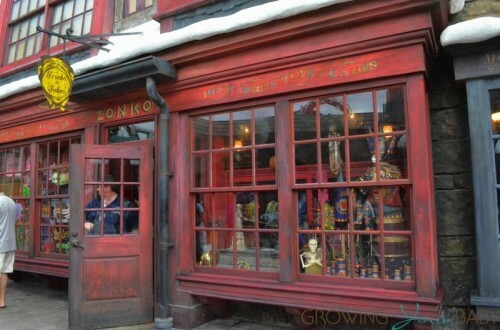 The cobblestone streets, Diagon Alley, the train – it’s all here, and all so. very. realistic. No detail has been left out. There is ‘snow’ on the tops of the buildings and smoke coming from the buildings that creates a haze through the village. Characters walking through the village, carts set up on the sides of the streets and all the shoppes that I had read about for years while following the series. The detail in every building was spellbinding. So much so that I forgot about the castle. That was until I turned the corner and there it was perched high above the park. Massive, meticulous and so medieval, it was FAR better than I had imagined it. 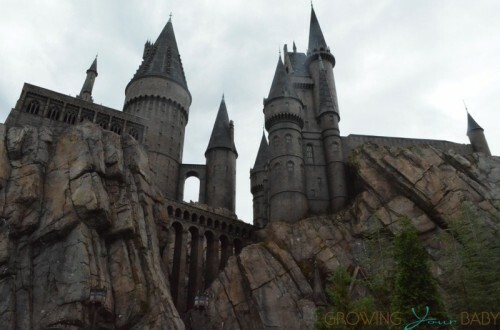 Thinking it was just a prop, I was excited to learn that Universal had also added some of the famous spaces into the castle. 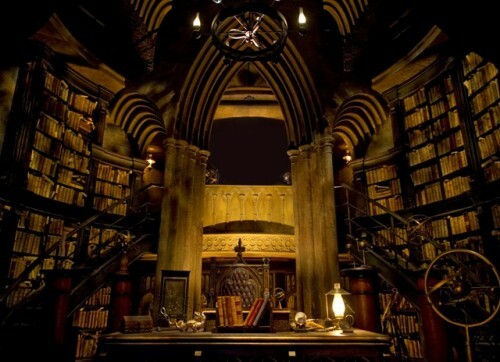 As you meander through the castle to ride Harry Potter and The Forbidden Journey you will pass by the wall of talking portraits, Dumbledore’s office, the Defence Against the Dark Arts classroom, the Gryffindor™ common room and the Room of Requirement. 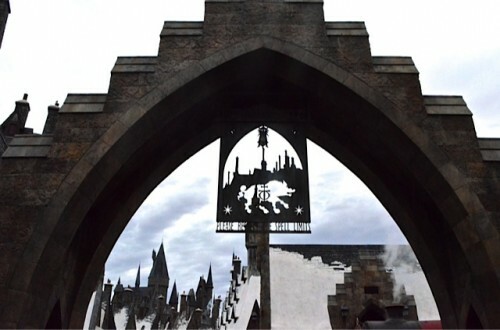 In each of these spaces there are holographs of the characters, including a speech from Dumbledore, and directions from Harry, Hermione and Ron. Our plan for this ride was for everyone to go together, but were informed that our boys were ‘this’ much too short. Thankfully Universal has this cool option called ‘kid swap’ where kids can sit with one parent in a room(where a movie is playing! ), while the other rides the attraction. When they are done mom and dad switch spots and the other enjoys the ride without having to wait in line all over again. It’s genius. The ride operators also gave my boys a certificate to skip the line the next time they are at Universal(and tall enough to ride). It made it somewhat better that they couldn’t go with us. This was MY favorite ride. In true Universal style it has crystal clear graphics, mixed with motion and scenes that are set up through out the castle. We twisted, turned and even went up side down. I loved it! To get the kids back on track, we rode the Flight of the Hippogriff™( a couple times) and they loved it. 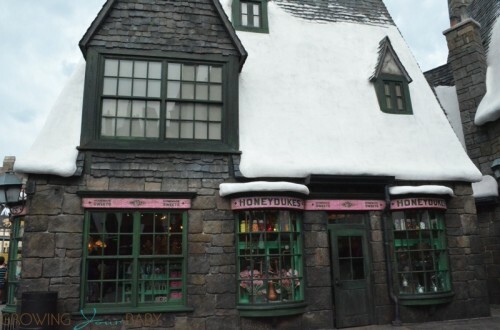 Afterwards we stopped for some treats at Honeydukes, visited Ollivander’s wand shop(where you can get the same consultation Harry got when he started school), and the Owl Post office before stopping at The Three Broomsticks bar to grab a butterbeer. Dear lord, where has THIS been my whole life? We were recommended the frozen variety and it was so good! 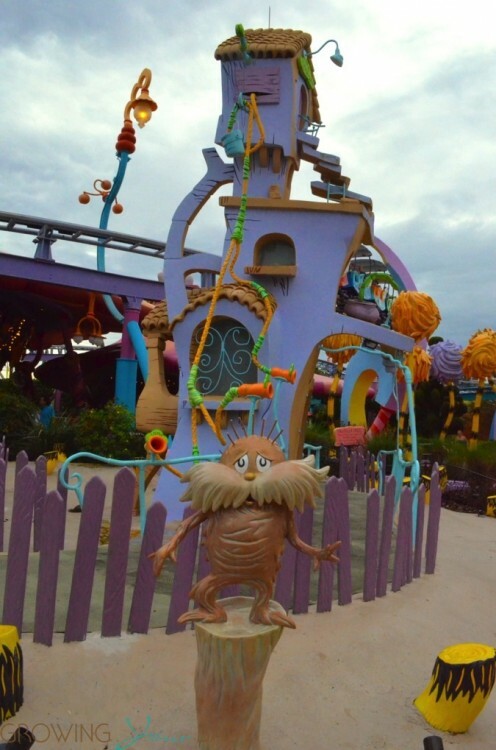 On our way back through we marveled at the beautiful Seuss Landing. Bold and cartoon like, I felt like we were walking through a movie set because all of our favorites were here – The Cat in the Hat, the Lorax, those blue and red fish, and everything in between. 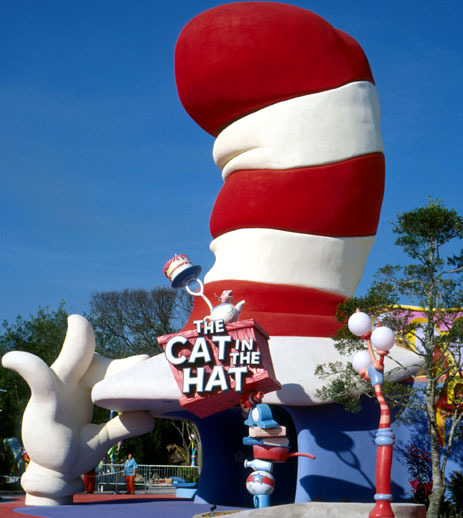 Kids can ride the Caro-Seuss-el, see the whole park from above on the The High in the Sky Seuss Trolley Train Ride or re-live that rainy day when Thing 1 and Thing 2 caused a bit of chaos at Sally and her brother’s house in Cat in the Hat. If you chose that ride, hang on to your hat because it swings and spins, through a bright set that depicts the bedlam that was brought on by the Cat’s spontaneous visit. 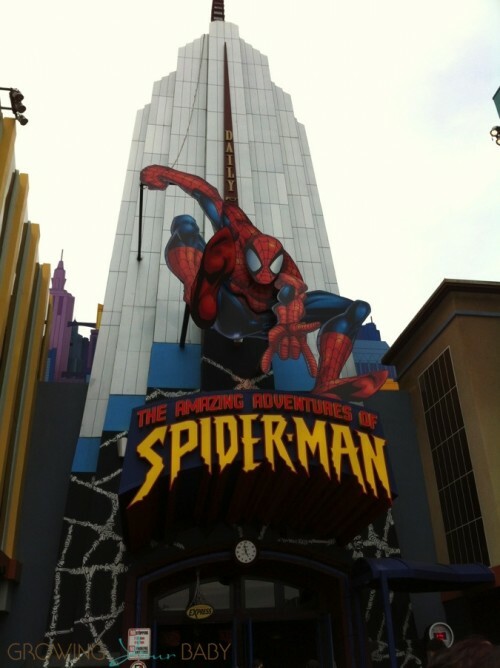 As our day was drawing to a close, and many of our tour mates were going in different directions to visit favourite attractions, we were faced with the opportunity to hit one more ride, and for my family it was unanimous – Spiderman. My youngest is the biggest Spiderman fan ever so this was his big moment, and thankfully Spiderman didn’t disappoint. There was water, fire and a TON of excitement. In fact, it was the ride of the day for my boys, who re-played every moment of it for the next couple days. We visited the park in the pouring rain, but that didn’t affect our day one bit. My boys were so captivated by all of the excitement they just trudged through all of puddles to get to the next attraction. They also couldn’t stop talking about how much fun they had. Next time we visit we will go for 3 or 4 days so that we have enough time to do each ride a few times.